Before we dive into the main differences between matcha vs. green tea, it’s important to understand what matcha powder is and where it comes from. Unless you’ve been living under a rock for the last few years then chances are you have heard of matcha or even tried a matcha smoothie. But what exactly is this green tea superfood and why has it become so popular? Matcha is the very best-quality, powdered form of specially cultivated green tea leaves. This superfood has gained traction in recent years for its high antioxidant content and energizing, metabolism boosting effects. That’s why it has earned a spot on my best smoothie superfoods list! But did you know matcha has been used for its nutritional benefits for centuries? The history of this famous green tea really begins with a Buddhist monk from Japan who is known to have introduced tea to his country hundreds of years ago. The monk even wrote his first book on the plant, laying emphasis on its benefits on vital human organs like the brain. Matcha green tea gives the body an immunity boosting and energizing effect. As a result, Buddhist monks have, over the years, used matcha to help them focus and stay mentally alert during meditation. The main difference between matcha and green tea lies in the cultivation and processing. Matcha green tea is simply green tea, but of the highest quality that has undergone special treatment during cultivation and processing. During cultivation, Camellia Sinensis plants designated for matcha green tea production (unlike other types of green tea) are grown in the shade for around three weeks. This process stimulates an increase of chlorophyll production in the plant, and is responsible for its famous green color. Studies have revealed that chlorophyll is great for eliminating toxic chemicals and heavy metals such as lead and mercury. Consequently, matcha can boost the body’s detoxification agents, and help to eliminate these unhealthy substances quicker. When the shade-grown Camellia Sinensis plant’s leaves are ready for harvesting, the finest leaves are hand-picked and the leaf veins removed for quality purposes. These leaves are then ground into a fine powder. Leftover leaves that didn’t meet quality standards are used to produce other types of green tea. Consuming matcha means you’re getting the benefits of the entire tea leaf. This means you’re getting a higher concentration of antioxidants, vitamins, minerals, and amino acids. Matcha is nutritionally 10x stronger than regular green tea, where you only get nutrients from what seeps into the tea water. One of my favorite health benefits from drinking matcha is that it can actually help you lose weight. Green tea is known to boost the thermogenesis process (the rate at which your body burns calories). This in turn, boosts the body’s metabolic rate. Considering the fact that matcha tea is an ‘amplified’ version of ordinary green tea, it delivers the same benefit but on a much higher scale. Matcha contains theophylline, a form of caffeine unique to tea. This special matcha tea caffeine teams up with a natural amino-acid derivative (L-Theanine) to produce a sustainable energy release for over 4 hours. So unlike coffee, matcha prolongs the energy release enabling you to stay active and alert all day long. Traditionally, Buddhist monks would consume matcha before going into long hours of meditation sessions. This would help them stay calm and focused. This is again attributed to the L-Theanine content of matcha tea. Matcha contains very high amounts of L-theanine when compared to regular green tea. L-theanine is a psychoactive amino acid, that has been shown to enhance brain function and improve your mood! Similar to raw cacao, one of matcha’s main benefits is that it is extremely high in antioxidants. In the preparation of matcha, the whole leaf is utilized which makes it easy to access all the vital nutrients of the tea leaves. This is why matcha is known to have very high amounts of antioxidants compared to standard green tea. The high levels of chlorophyll in this vibrant green superfood also aid in the detoxification process. When it comes to matcha vs. green tea, matcha is much better equipped for detoxification. Traditionally, matcha is consumed as a warm tea similar to green tea. Instead of steeping matcha, warm water is added directly to the powder and then whisked together until frothy. This allows you to get all of the nutritional benefits of the powder. This smoothie combines all the amazing health benefits of matcha with nutritious leafy greens like kale and spinach. Tropical fruit is added to give the smoothie a delicious and refreshing flavor! What's not to love? The flavor of matcha works really well in desserts or sweet recipes. This cheesecake swirl recipe from MinimalistBaker.com is the perfect example of this. A healthy (mostly) dessert? It's like having your cake and eating too! This coconut milk matcha latte from loveandlemons.com is a more modern and delicious take on the traditional matcha tea. The coconut milk adds a nice flavor and creaminess to the tea. This vibrant latte works great as a coffee replacement thanks to matcha's energizing properties! When it comes to buying matcha powder there are a few things you need to know. Most importantly, matcha comes in different grades that represent both the quality and purpose of the matcha powder. I only recommend either the ceremonial grade or the culinary grade matcha because they are the highest quality. Ceremonial grade matcha is made specifically for traditional style tea – just add hot water, whisk until frothy, and enjoy. This premium grade of matcha is known for being the most vibrant in color. It is harvested from younger leaves which gives it a very sweet and nuanced flavor profile with a fresh grassy scent. Ceremonial grade matcha could be used for cooking or baking but you will be losing the delicate flavor that you are paying a premium for. Culinary matcha is best suited for the less traditional matcha recipes. It is of equally high quality compared to its ceremonial counterpart, but it is harvested and prepared for a different purpose. Culinary grade matcha has a more robust flavor that won’t be lost when combined with other ingredients making it better suited for cooking or baking. Culinary matcha can still be used for traditional matcha tea but you will need to add some sweetener if you want a more balanced ceremonial flavor. I put together the following infographic for all you visual learners out there. 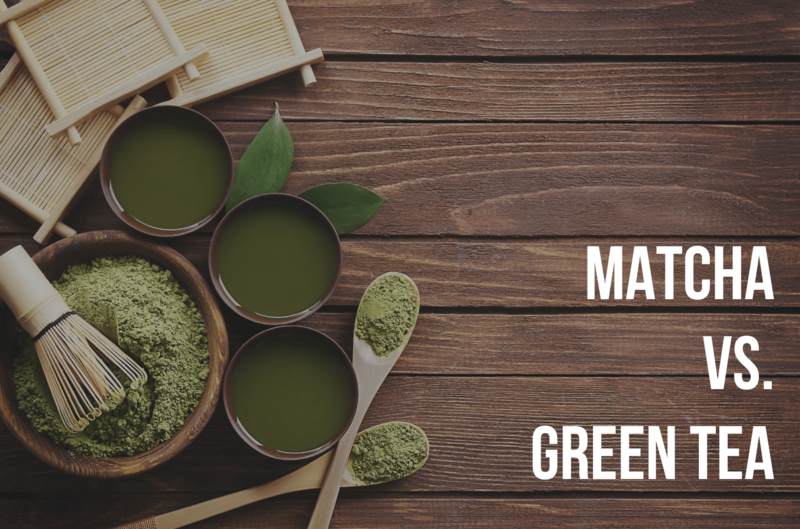 It summarizes this post and highlights matcha’s main benefits and differences compared to green tea. If you found this post helpful please share this infographic on social media or embed it on your website. It’s a great way to support the blog and help me reach more readers! Please include attribution to livingfreshdaily.com with this graphic.